This topic contains 6 replies, has 4 voices, and was last updated by Vanellus 6 months, 3 weeks ago. I’m not claiming any improvement on my ‘chilly’ earlier offering, in fact I’ve rather rushed this one (going off on holiday this afternoon, possibly no internet access). So it isn’t as polished as I might have wished, but that’s where feedback from you comes in helpful – if you’re willing! At least it should be good for a laugh, as you may soon discover! Mindful that it may be a while before I get back here, I’m posting a link to the online, interactive version, here – complete with CHECK, REVEAL and SAVE buttons – so you can take your pick! Kept me quiet for several days and am now missing just one solution, where/how do I find this on-line link toenable completion /satisfaction. Favourite clue undoubtedly “non-existant” cheese! Glad you liked my ‘cheese’! I’ve a sneaking feeling, that wordplay must have been used by others before me, it’s so obvious from the setter’s viewpoint! Anyone else wanting to comment – please do! I solved about three-quarters of the clues on a half-hour train journey a couple of weeks ago, but then got completely stuck, with most of the SW corner empty. However, when I got back to my Chambers and, following a hunch, looked up flax , sure enough, I found a five-letter Latin name beginning with L. With the extra crossers, I managed to complete the grid. However, I completely missed the nina, which I’ve only just found now, despite having read the pointer to it when I read the solution soon after finishing, probably because of the starting point. Ha. I remember hearing that (from my Latin teacher, I think) when I was 11 and thinking it was quite funny. Still, very clever to get a decent fill, even if you had to include SNOT! 12a An unforced gnu! Nice. 18 I didn’t read it as a dd as parsed, but a cd. 20 Good surface. Great misdirection with “firm”. 27 Didn’t get the wp. Is it fashioable to be upper class? I took “nose-drool” as the def. 1 I didn’t understand Here Today, and I don’t think it works really to use the Beeb’s affectionate nickname this way — bit of a double jump? Maybe I’m just sore at not getting the def? The wordplay was very clear, though. 2 Amazingly, I didn’t really understand this clue till I saw your notes, even though it was obvious which cheese was needed. I thought you were somehow saying it was “unmade” or something. Der! 3 Not a very good def, and I’m not sure I like “to” to mean “after”. I suppose it is joined “to”, but still it’s more jarring than the other unXims. 4 I’m not coming to dinner. 5 Didn’t remember the character, just thought it was weird. “Damp” isn’t quite it, is it? 6 Better than last time you and alum were keeping company in my head. What is it with the alum, anyway? 13 What a pity you didn’t have a way to use “parted” instead of “raised”. 15 DIG as “like” went over my head, but perhaps that’s because DIG IT is “like it“, surely? 17 Unindicated abbreviations can be a bit unfair. 20 “develop a piece” is great deception, but it would have been better if the beginning had fitted the chess motif better. 25 Isn’t agora a Greek word, rather than Latin first declension? I didn’t do Greek, so I don’t know what the plural would be. Anyway , in English I’m pretty sure it’s just agoras. Is there something I don’t know/undestand that justifies it? 28 BIFD. “organise” is a bit wide for tabulate. Pretty good fun all round, with a nice bonus of seeing the nina when I came back to it to comment. Cheers, Laccaria! I agree making the Nina start on the ‘wrong’ square makes it harder to spot. I found it was a devil of a constraint when I was trying to squeeze filler words around the edges. Especially that 4-letter word ending in J. Only one I could come up with: are there any others? Also agree that I’m not over-fond of 27a, quite apart from its being a rather nasty word! Incidentally, I thought that “U” for fashionable is quite a common device in crosswordland – I looked it up and the expression “U and non-U” dates all the way back to 1954 and one Professor Alan Ross, though the terminology was pounced upon and popularised by the author Nancy Mitford (none of whose works I’ve read, I’m afraid – probably that places me in the non-U category…). 1d: “Here Today”, implying “Here you may listen to the Today programme” is perhaps too obscure a def. even for BBC devotees! I think if one of the Grauniad setters had used that device there’d be howls of anguish! OK.
3d maybe better as an across clue? 13d that’s too biblical for me! 🙂 Of course I had no option for this word, part of the nina. 17d another forced filler! I did my best. The abbbreviation is commonplace in some universities. 19d someone else made the same criticism. “May cause fire…” perhaps better? 25d Chambers allows -AE for the plural. 28d once again someone else made the same comment. Anyway thanks again for your feedback, Whynot, most useful! I think with H_DJ to fill, HADJ is the one to go for. I liked it anyway, because I know some Arabic. I prefer the spelling HAJJ, which is more transliterative, but HADJ is well-recognised. 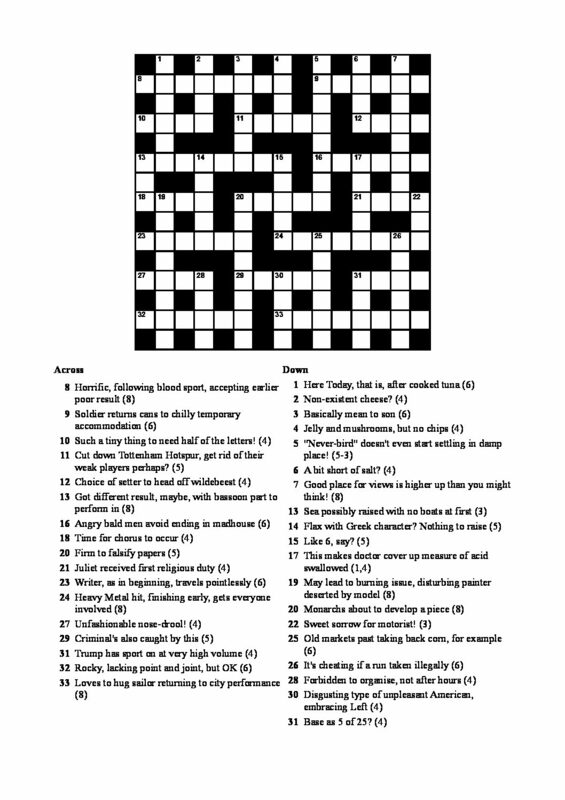 It was in a Guardian Genius crossword recently too! It may have been fashionable in the 50’s (more so before WWII, probably) to emulate the upper classes, but these days it’s probably more modish to speak in a more plebian manner. Innit? 1d I just don’t think you’d say “The Today programme is on Auntie in 5 minutes”; it’s a double jump. Others may disagree. In 3d, I’m just not keen on “A to B” meaning BA, and I don’t think you really see it even, though I could be wrong. 25d Fair enough. The Romans must have adopted it as a first declension noun. I got it and never checked, just thought “that’s Greek”. Good clue! 31d What’s wrong with ROOT? Plenty of possibilities, including your misleader. It’s just that 15-B had something similar, I seem to remember, so I was wise to the trick. I downloaded this on Monday, at the same time as Nutkin’s. I am still relatively inexperienced, and after making a reasonable start on yours, I seemed to come up against something of a brick wall. I tried the Nutkin one for a break, which I found rather more accessible. I did return to your puzzle, and made a bit more progress, before eventually using the interactive version to check that 19 was correct. This proved to be the thin end of the wedge, and I soon found I was revealing letters far more than I intended, so I can’t claim to have honestly completed it. I then read the correspondence with Whynot above, which I found very illuminating. In addition, could I respectfully make the following observations? 8 I didn’t get the definition. I wonder if “Horrific when following blood sport” would be a little easier to latch onto? Probably the rest of the clue might then need a slight tweak? Or would that be too obvious? 27 I would tend to agree with Whynot: I would never have connected U and non-U with being fashionable or otherwise, and only assumed the answer from “nose-drool”. 31 Lost on those of us who aren’t bridge players, but that’s fine – I’ve learnt something! 1 The first clue that I got, although the definition is perhaps debatable. 5 Didn’t know the reference, but it didn’t stop me solving it. 14 I was originally puzzling over “linen”, but then got Asimov in for 23, so had a quick Google check which confirmed linum. Good clue. 15 I’m missing something here! I have followed the comments above as to whether it might most fairly be “dig” or “dit it”, but I’m still puzzled by the “6, say?”. Your solution doesn’t mention it, unfortunately. Digging alum, I presume? I’m not sure where my nearest alum mine or quarry might be. 17 I had no problem with it being an abbreviation, but perhaps it helped I already had the D in from 15. If I wanted to be truly pedantic, I might argue that pH is a measure of acidity, rather than a measure of acid? 19 Although I was fairly sure I had this from the definition, I didn’t get the “T” from “model”. Perhaps I should have, as I have used this myself, but only in a clue with a surface reading concerning cars. Perhaps “old model” would give a hint without detracting from the surface in this case? 25 Good clue, which I didn’t solve, and I won’t get into the linguistic debate! 28 I wasn’t aware of this spelling, so again, something to remember. 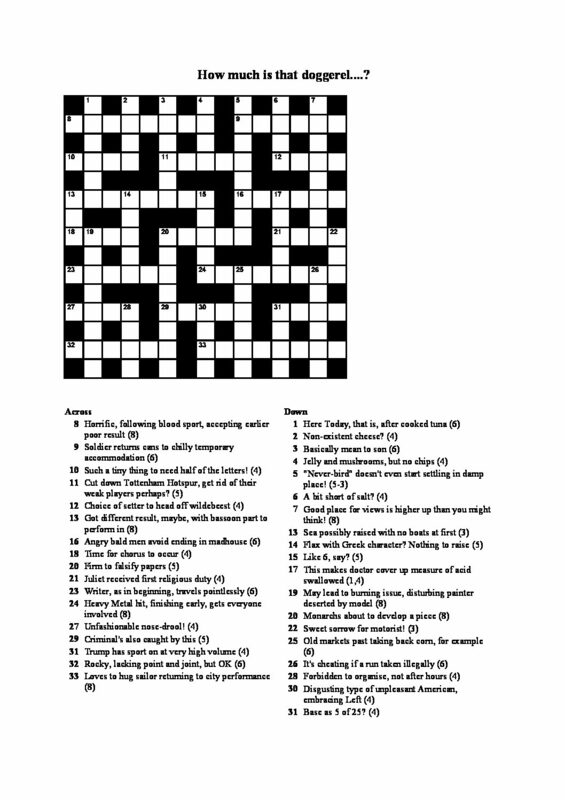 Many thanks for your time in compiling this puzzle, which proved a little more challenging than most I’ve attempted, but still very enjoyable. I will certainly look at your older puzzle in due course. This reply was modified 6 months, 3 weeks ago by Vanellus.